R is by far the best software you can use if you want to conduct quantitative analyses of political data. Importantly, data analysis is no longer restricted to analyzing survey data but also social media data, texts, event data, images, geographic data, and so forth. For that and other reasons listed below, R is a great tool to learn. In this book, we aim to provide an easily accessible introduction to R for the study of different types of political data. Specifically, the book will teach you how to get different types of political data into R and manipulate, analyze and visualize the output. In doing this, we will not only teach you how to get existing data into R, but also how to collect your own data. Compared to other statistical packages, such as Excel, SPSS, Stata and SAS, you will experience that R is somewhat different. First in a bad way: if you are used to, say, SPSS, things are not as easy as they used to be. Then in a good way: once you learn how to do different tasks in R, you will be ashamed when you look back at the old you doing analyses in SPSS or something just as embarrasing. In this chapter you will find an introduction to the basics R. The introduction takes place in three steps. First, we ask the obvious and important question, why R? Second, we help you install what you need. Third, we introduce the logic of doing thuings in R so you are ready for the chapters to come. Have fun! First, R is an open source statistical programming language. R is free, and while you might not pay for Stata or SPSS because you are a student, you will not have free access forever. This is not the case with R. On the contrary, you will never have to pay for R.
Second, R provides a series of opportunities you do not have in SPSS and Stata. R has an impressive package ecosystem on CRAN (the comprehensive R archive network) with more than 12,000 packages created by other users of R. You can compare R to an iPhone. If you didn’t have the possibility to install apps on the iPhone, its functionality would be limited. In R, just as with iPhones, you have several apps (in R called packages), you can install and use in order to make life easier. Third, some of the most beautiful figures you will find today when you open the newspaper are created in R. Big media outlets such as The New York Times, BBC and FiveThirtyEight use R to create figures. Specifically, they use the package ggplot2, a very popular package used to create figures. We will work with this package later. Fourth, there is a great community of R users that are able to help you when you encounter a problem (which you undoubtly will). R is a popular software and in great demand meaning that you will not be the first (nor the last) to experience specific issues in R. Accordingly, you will find a lot of help on Google and other places to a much greater extent than for other types of software. Fifth, while you can’t do as much point-and-click as in SPSS and Stata, this approach facilitates that you can reproduce your work. In other words, it is easy to document what you are doing in R with commands in a script (more about this later). So, while you do not see a pedagogical graphical user interface in R with a limited set of buttons to click, this is more of an advantage than a limitation. Again, at first sight, this might seem confusing and frustrating, but we promise that, once you get used to it, you are a better scientist. We will actually install two programmes. First R and then RStudio. You can compare R to the engine in a car. We call this the R language. You can compare RStudio to the beautiful car in which you have the engine. We call this the graphical user interface. Click Download R for Windows if you use Windows or Download R for (Mac) OS X if you use Mac. Click the top link where you can download R for Windows. Select the most recent .pkg file under Files: that fits your OS X. If you encounter problems with the installation guide, make sure that you did download the correct file and that your computer meets the requirements. If you did this and still encounter problems, you should get an error message you can type into Google and find relevant information on what to do next. You should now have the R language installed on your computer. However, you do not need to open R or anything yet. The only thing we will open is RStudio, which we will install next. Click on the installer file for your platform, e.g. Windows or Mac OS X. 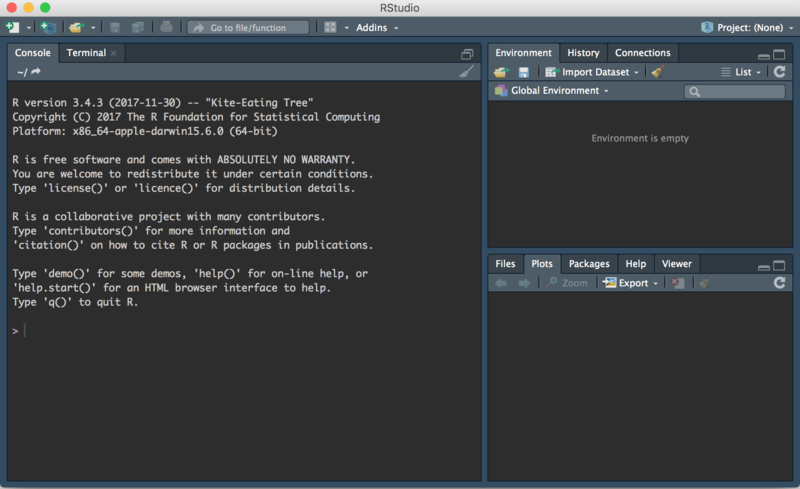 You should now have RStudio installed on your computer. When you open RStudio, you will see a graphical interface as in Figure 1.1. There are three different windows. However, one is missing, and that is the window where you will write most of your scripts. You can get this window by going to the top menu and select File \(\rightarrow\) New File \(\rightarrow\) R Script. This should give you four windows as you can see in Figure 1.2. 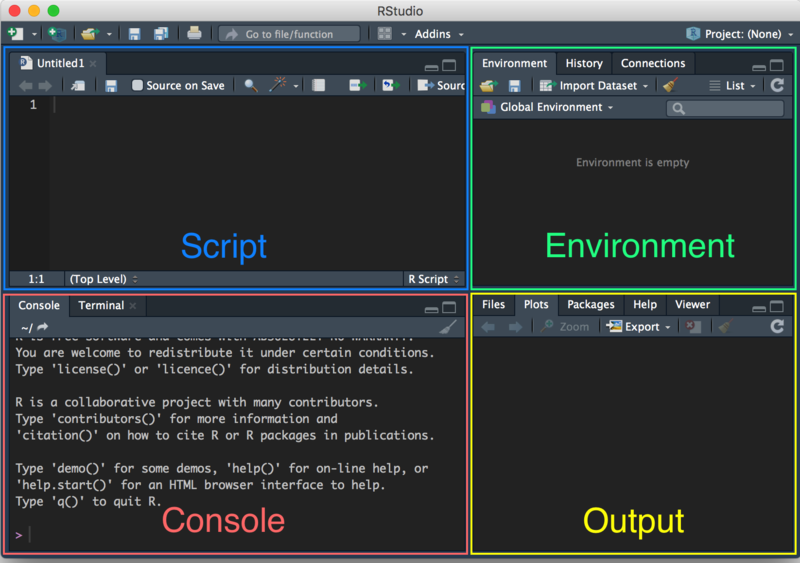 In the figure, we have emphasized the four windows: script, environment, output, and console. The script is where you will have your R code and can add code and make changes to your script. The environment is where you can see what datasets, variables and other parts you have loaded into R. The output is where you can see the figures you create as well as documents. The console is where you can see your output and run commands. 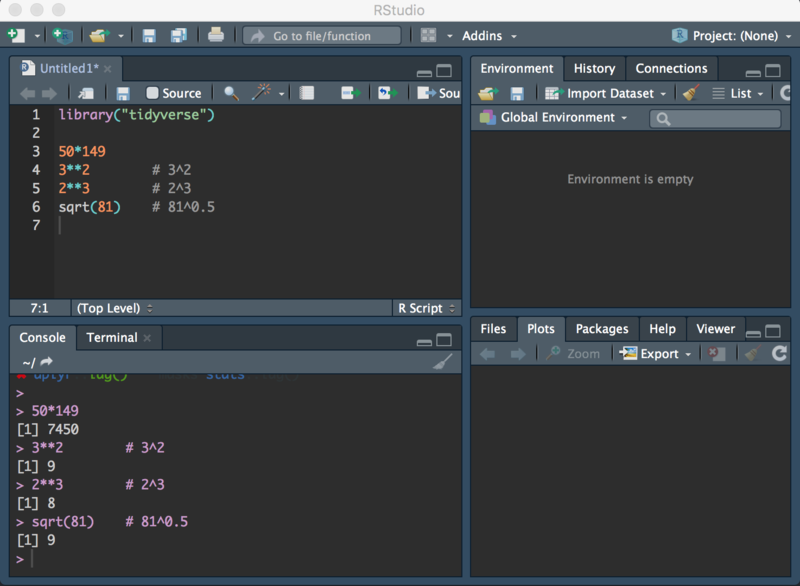 As you can see, the background is dark in the RStudio environment in Figure 1.2. The first time you open RStudio, the background will be white. If you want to change the colours of your RStudio environment, go to Tools \(\rightarrow\) Global Options... \(\rightarrow\) Appearance. As you can see, we have used # as well. The # sign tells R that everything after that sign on that line shouldn’t be read as code but as a comment. In other words, you can write comments in your script that will help you remember what you are doing - and help others understand the meaning of your script. For now, remember to document everything you do in your script. Do also remember to add space between your lines of code. This will make it easier for you to read as your script gets longer. Notice also that we use a function in the bottom, namely sqrt(). A lot of what we will be doing in R works via functions. For example, to calculate a mean later we will use the mean() function. In the next section we will use functions to install and load packages. We mentioned that one of the key advantages of using R is the package system. In R, a package is a collection of data and functions that makes it easier for you to do what you want. Againm, while R is similar to an iPhone, all the packages are comparable to apps. The sky is the limit and the only thing you need to learn now is how to install and load packages. You only need to install the package once. In other words, when you have used install.packages() to install a packagae, you will not need to install that specific package again. Note that we put tidyverse in quotation marks. This is important when you install a package. If you forget this, you will get an error. Make sure that you type it exactly as noted above. If you forget a letter (e.g. install.package instead of install.packages), it will not work. To recap, it is always a good idea to begin your script with the package(s) you will be working with. If we want to have a script where we load the tidyverse package and have some of the commands we ran above, the script could look like the script presented in Figure 1.3. In other words, do not include the library("") line in the middle of your script, but have them all at the same time in the beginning of your script. If you want to save your script, you can select File \(\rightarrow\) Save, where you can pick a destination for your script. It is always good to save your script so you can get back to it a later stage. As noted above, you will encounter problems and issues when you work in R. Sadly, there are many potential reasons to why your script might not be working. Your version of R or/and RStudio might be too old or too new, you might be using a function that has a mistake, you might be having a small typo, you might not have the data in the right format etc. Consequently, we cannot provide a comprehensive list of errors you might get. The best thing to do is to learn how to find help online. Here, the best advice is to use Google and, when you search for help, always remember to mention R in your search string, and, if you are having problems with a specific package, also the name of the package. For example, if you have a problem with creating a bar chart with the ggplot2 package, a search string in Google could be ggplot2 bar chart and not just R bar chart.